姚昀, 刘克海, 胡晓倩. 紫檀茋影响脂多糖诱导巨噬细胞炎症因子的变化[J]. 上海海洋大学学报, 2019, 28(1): 29-36. YAO Yun, LIU Kehai, HU Xiaoqian. Effects of pterostilbene on lipopolysaccharide-induced inflammatory cytokine expression in macrophages[J]. Journal of Shanghai Ocean University, 2019, 28(1): 29-36. FRANCESCHI C, CAMPISI J. Chronic inflammation (inflammaging) and its potential contribution to age-associated diseases[J]. The Journals of Gerontology. Series A, Biological Sciences and Medical Sciences, 2014, 69(s1): S4-S9. 倪湾, 李敬双, 于洋. 洋葱槲皮素对脂多糖诱导的小鼠腹腔巨噬细胞炎症反应抑制作用[J]. 食品工业科技, 2017, 38(23): 284-288. NI W, LI J S, YU Y. Inhibiting effect of onion quercetin on lipopolysaccharide-induced mice's enterocoelia macrophage inflammatory response[J]. Science and Technology of Food Industry, 2017, 38(23): 284-288. HANADA T, YOSHIMURA A. Regulation of cytokine signaling and inflammation[J]. Cytokine & Growth Factor Reviews, 2002, 13(4/5): 413-421. 徐方方, 漆睿, 江斯炜, 等. 紫檀芪的研究进展[J]. 中药新药与临床药理, 2017, 28(3): 406-410. XU F F, QI R, JIANG S W, et al. Progress in pterostilbene research[J]. Traditional Chinese Drug Research & Clinical Pharmacology, 2017, 28(3): 406-410. 王标, 杨玲英, 曾庆友. 天然抗氧化剂紫檀芪的合成[J]. 应用化工, 2015, 44(3): 431-433. WANG B, YANG L Y, ZENG Q Y. Study on the synthesis of natural antioxidant Pterostilbene[J]. Applied Chemical Industry, 2015, 44(3): 431-433. 付光新, 姜鲜, 李佳, 等. 白藜芦醇对LPS刺激RAW264.7细胞炎症因子影响研究[J]. 现代预防医学, 2010, 37(3): 568-569, 575. FU G X, JIANG X, LI J, et al. 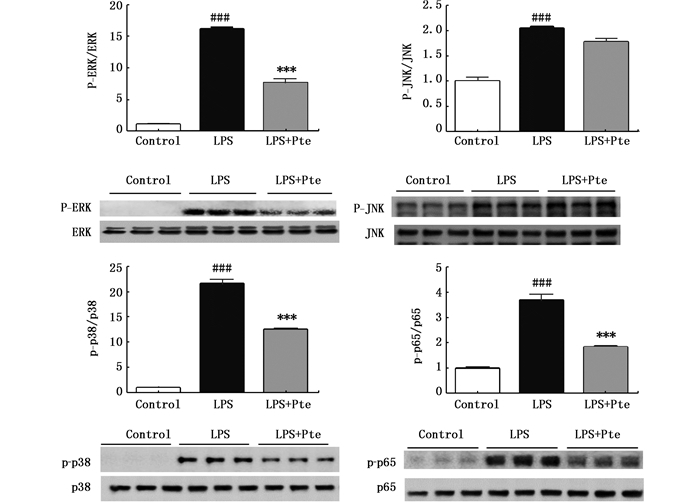 The effects of resveratrol on inflammatory cytokines release from RAW 2647 cells induced by LPS[J]. Modern Preventive Medicine, 2010, 37(3): 568-569, 575. 刘芳, 曲极冰, 李红, 等. 白藜芦醇抗炎作用机制的初步研究[J]. 中国药学杂志, 2006, 41(15): 1138-1141. 彭洁, 韩雪莹, 胡晓燕, 等. 白藜芦醇对外周血单个核细胞中IL-1β、IL-6、MCP-1及SOCS1/3表达的影响[J]. 山东大学学报(医学版), 2011, 49(11): 64-68. PENG J, HAN X Y, HU X Y, et al. 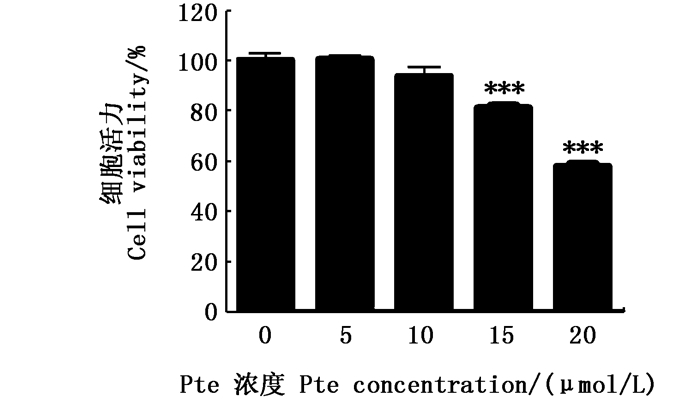 The effect of resveratrol on expression of IL-1β, IL-6, MCP-1 and SOCS1/3 in human peripheral blood mononuclear cells[J]. Journal of Shandong University (Health Sciences), 2011, 49(11): 64-68. JIANG F, GUAN H N, LIU D Y, et al. Flavonoids from sea buckthorn inhibit the lipopolysaccharide-induced inflammatory response in RAW264.7 macrophages through the MAPK and NF-κB pathways[J]. Food & Function, 2017, 8(3): 1313-1322. Abstract: To evaluate the anti-inflammation effect of pterostilbene on RAW264.7 macrophages, an inflammation model in vitro was established by lipopolysaccharide (LPS) stimulation. After exposing RAW264.7 cells to pterostilbene and LPS, the mRNA expression of inflammatory cytokines including monocyte chemoattractant protein (MCP)-1, interleukin (IL)-6 and IL-1β, tumor necrosis factor (TNF)-α, and inducible nitric oxide synthase (iNOS) were detected by real-time quantitative polymerase chain reaction (qPCR). Nitric oxide (NO) production in supernatant was analyzed using Griess method. The protein expression of extracellular regulated protein kinases (ERK), c-Jun N-terminal kinase (JNK), p38 mitogen-activated protein kinase (p38 MAPK) and Nuclear factor-κB p65 (NF-κB p65) were detected by Western blot analysis. The results showed that pterostilbene significantly inhibited the gene expression of inflammatory cytokines and the production of NO. Pterostilbene significantly suppressed LPS-induced ERK, p38 and p65 phosphorylation. Data showed that pterostilbene could inhibit the mRNA expression of LPS-induced inflammatory cytokines including MCP-1, IL-6, IL-1β, TNF-α and iNOS, and the release of NO, and its mechanism may be related to blocking the mitogen-activated protein kinase (MAPK) and NF-κB pathway.